Ridge Trail about a mile from Alpine Road, looking northwest. Nothing beats a ride along Skyline on a weekday in the spring, wildflowers in bloom. 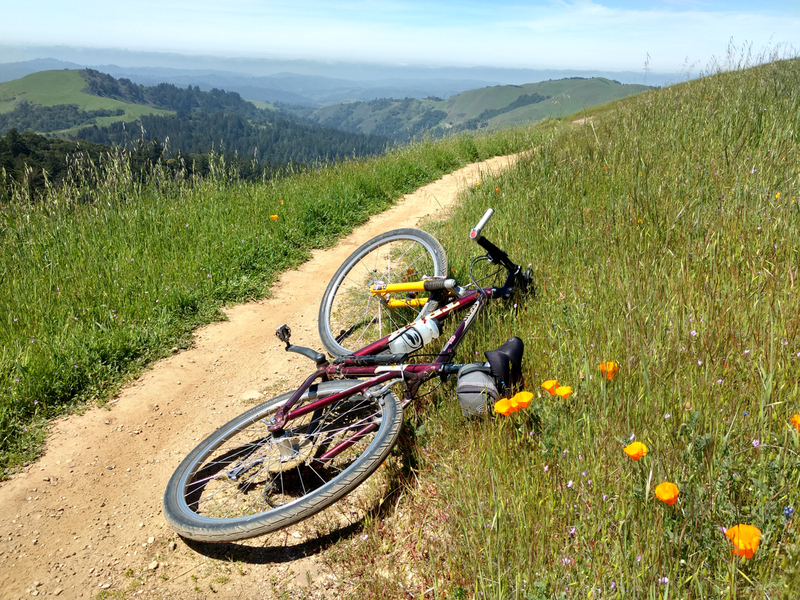 I checked out Russian Ridge Open Space by mountain bike. 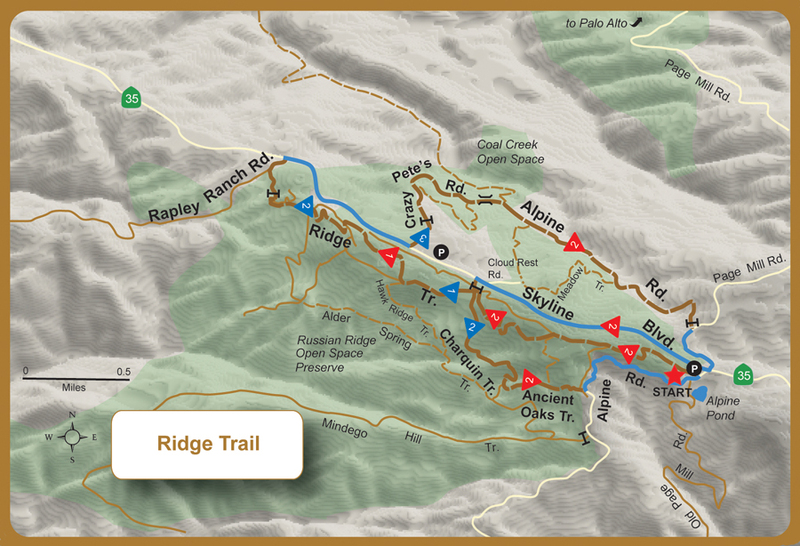 My plan was to ride the Ridge Trail to Rapley Road and then make a loop via Crazy Pete’s Road and Alpine Road. Ridge Trail about a mile from Alpine Road and Skyline Boulevard has views of the Pacific Ocean on a clear day. It’s mostly single-track for lovers of that kind of riding. The trail is narrow and there’s a vertical drop-off to keep your attention. All the trail junctions are well marked. I headed down Crazy Pete’s, having ridden this road since about 1981. It’s a bit gnarlier than it used to be, but still rideable, except for one steep climb. Seeing Alpine Road in its current condition depresses me. It used to be a real dirt road, maintained by San Mateo County. It was last graded in December 1989. Why San Mateo County insists on keeping a claim on the road is beyond me. It’s a trail today, lined with poison oak, rutted, a disaster. A washout higher up was “repaired” with a steep trail into the creek bed. Years ago, the county proposed a recreation trail, but I haven’t heard of any movement to make it happen. The road maintained a grade of 8-10 percent, not bad compared to Page Mill Road. After the massive landslide in the early 1990s, the road became much less pleasant to ride. So much for Alpine Road. I’m glad I had a chance to ride it in its glory days. I took Meadow Trail uphill, and wished I hadn’t. It’s rocky, STEEP, and doesn’t have anything to offer in the way of views. Skip it. Russian Ridge Preserve has some nice trails. Nothing too steep, although there are always those short stretches of hard riding. Charquin Trail certainly was a ranch road at one time. It seemed more like the kind of dirt roads I used to ride in the Santa Cruz Mountains. Russian Ridge preserve offers some nice dirt rides. This entry was posted on April 25, 2018 at 7:37 pm and is filed under Ride reports. You can follow any responses to this entry through the RSS 2.0 feed. You can leave a response, or trackback from your own site.